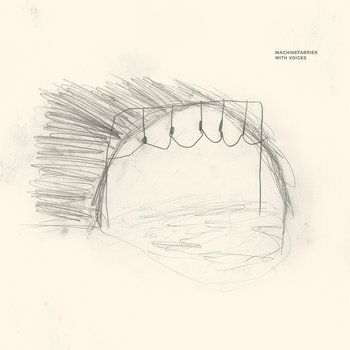 Brainwashed - Machinefabriek, "With Voices"
With Voices is the newest recording by Dutch composer Rutger Zuydervelt under the moniker Machinefabriek. True to its title, the album’s eight pieces exhibit Zuydervelt's use of cassette recorders, tone generators, radios, synths, and other hifi curios to construct bewildering aural architecture around vocal work from Peter Broderick, Marissa Nadler, Richard Youngs, Chantal Acda, Terence Hannum (of Locrian) and others. These human voices are featured as musical instruments rather than mere vehicles of lyrical content, resulting in a sub-linguistic mosaic of primordially stirring moods. The initial spark of With Voices was kindled while Zuydervelt was in Taipei creating music for a dance company. In the final days of his trip, a dancer named Wei-Yun Chen caught Zuydervelt's ear with an instagram video featuring a voice that turned out to be Wei-Yun's own (she would end up on the album’s seventh movement, a piece that features dissected bits of Taiwanese poetry amid low-pitched murmurs and whispering fogbanks of static). The encounter stirred Zuydervelt to create a single 35 minute soundscape upon which each vocalist on With Voices was encouraged to improvise, be it talking, reading, singing, or wordless, guttural intoning. Such vocal smatterings were then used to determine how the other tonal elements should be arranged, dictating where each musical passage would ultimately lead. "The idea was for everyone to just do what came naturally" he recalls, "the element of unpredictability was important to me." Indicative of this approach "III" (the tracks are simply titled with Roman numerals) slowly winds like ivy through staccato phrases spoken by Zuydervelt's peer Peter Broderick, whose micro-incantations skip along mechanically only to telescope into monastic grandeur at the track's midpoint; the vibrations of vocal cords are often stretched to a seismic hum to form the heavy implements in Zuydervelt's toolkit. On "V," tape recordings of Berlin electronic artist Zero Years Kid (aka Joachim Badenhorst) sputter with their own apparent intelligence like a faulty AI attempting to interpret reels of human speech in some ruinous library of the distant future. Finally, a Siren-like Marissa Nadler leads the suite to its lullabic endpoint with overlapping wisps of harmony devoid of accompaniment ending the album on an angelic note. In these moments, like much of With Voices, warm-blooded arteries seem to have grown around bits of well-designed artifice to form something warmly alien, soberly futuristic, and inherently satisfying. More than simply an album of collaborative features, With Voices is a mutating collage of modern minimalism that challenges as often as it comforts. There is an alchemical, metallurgical quality that arises from Zuydervelt's unique way of merging humanness with abstraction, harshness with beauty, and unintelligibility with familiarity on what may be the most affecting Machinefabriek release to date.